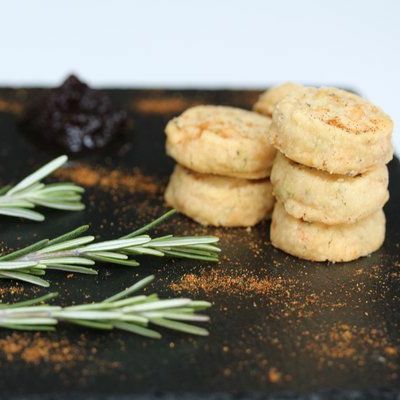 Cheddar, Rosemary & Chilli - extra mature cheddar cheese blended together with earthy rosemary and spicy chilli. Extra delicious when topped with fig chutney. Parmigiano Fig & Tarragon - matured Parmigiano combined with sweet dried organic figs and fresh tarragon leaves for a slight floral sweetness, finishing with a hint of aniseed. Stilton, Cranberry & Walnut - Stilton cheese and walnut give an earthy flavour, with dried cranberries adding a sweet end. Try with a medium red wine or a glass of port. 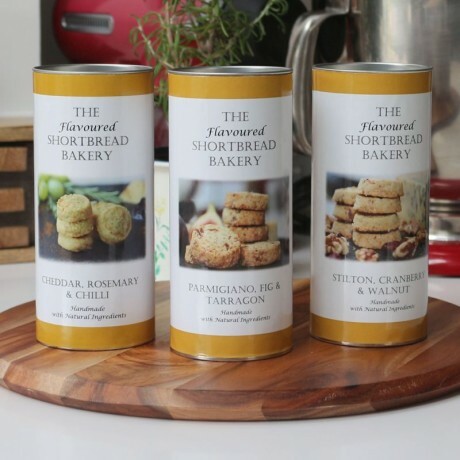 These indulgent shortbreads are made entirely by hand to a traditional recipe, with only natural ingredients. Each of the three tubes weighs around 120g and contains 8 shortbread rounds. Cheddar, Rosemary & Chilli: Fortified wheat flour, Butter (unsalted) (Milk), Extra mature Cheddar cheese (Milk), Rosemary, Cayenne pepper, Demerara sugar, salt. 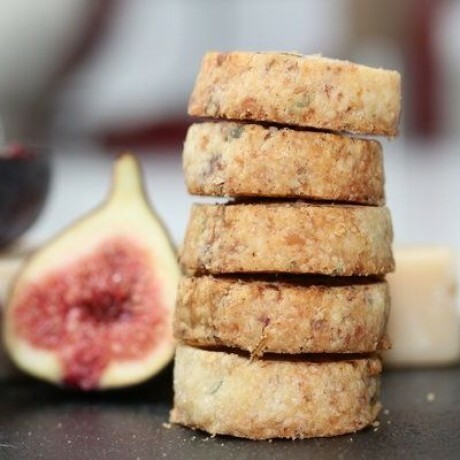 Parmigiano Fig & Tarragon: Fortified Wheat Flour, Butter (unsalted) (Milk), Parmigiano Cheese 20% (Milk), Tarragon 1%, Fig 1%, Demerara Sugar, Rock Salt. 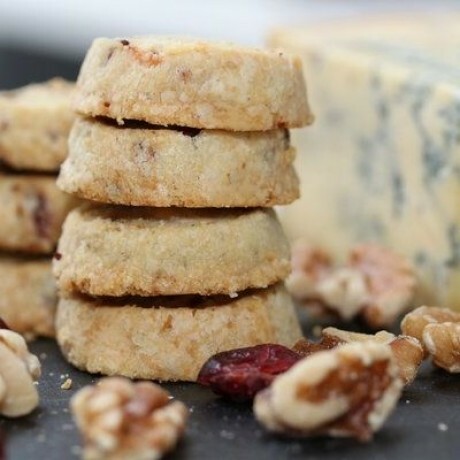 Stilton, Cranberry & Walnut: Fortified Wheat Flour, Butter (unsalted) (Milk), Stilton Cheese 20% (Milk), Walnuts 3%, Cranberry 3%, Demerara Sugar, Rock Salt.